The talent inside the Brewers farm system is clear and tangible, but the development of that talent is an unclear process. The Crew is widely considered to be one of the best at growing their own stars, using the farm to continually make the big club better - whether by promotion or trade. That said, there are problems with the way the Brewers are developing their prospects - some philosophical, some bad decisions. Management of the 40-man roster is always hit or miss, there will be players that hold a spot on the roster for reasons of depth or for reasons that no one can quite understand. Players will be removed and be lost to another team for reasons that only management can rationalize. There are two names that come to mind that illustrate a couple of odd, confusing and downright stupid decisions that management made in regards to this season's 40-man roster. 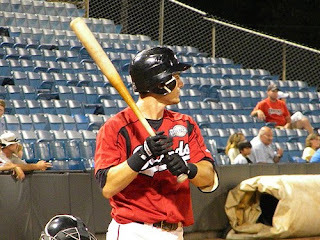 The first name that stands out is Adam Heether, a super-utility player that can play six positions around the diamond. Heether was coming off a career year for Triple-A Nashville in which he hit .296 with 18 homers and a .396 OBP. He got off to a slow start with Nashville this year and when Mat Gamel came off the 60-day disable list Heether was dropped from the 40-man roster to make room. He was claimed by Oakland and now plays with their Triple-A club. But why does this move make sense? With Gamel in Triple-A and Zealous Wheeler and Taylor Green in Double-A the team must have thought they didn't have a need for Heether. But none of those three players have the same level of versatility, combined they can play three different positions (3B, SS, 2B) but that still doesn't match up to Heether. Also, Wheeler and Green aren't even on the 40-man roster, so if needed they won't be able to help the big club this season anyways. What's worse is that this move came at a time when Jeff Suppan was still taking a roster spot as well. Utility players like Heether don't come around often and letting him go for nothing makes absolutely no sense. Another prospect that is wasting a 40-man roster space is under-performing pitcher Alex Periard. Pitchers who have done much more have not found their way onto a big league team's 40-man roster. So what, exactly, has Periard done to place himself on the 40-man? A 16th round pick in 2004, he has failed to pitch well above A-ball. His best years came in 2007 and 2008 before he was promoted to Double-A. In those two seasons he posted an ERA of 3.55 and 3.51. 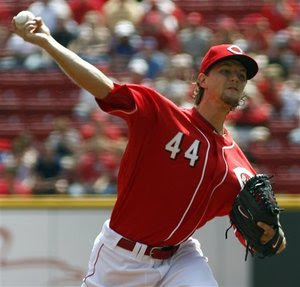 In his stints in Double-A he posted an ERA of 5.68 (8 games in 2008) and 4.71 this year. There was nothing in his numbers to indicate he deserved a 40-man spot and you'd be hard pressed to find anyone who would put him on a top ten prospect list for the Brewers - even top twenty might be a stretch. But he's there, burning option years and underwhelming the competition. It can't be said that Milwaukee doesn't promote prospects in season, Jonathan Lucroy is an excellent example of that being false, but it's not the promotions that do happen that surprise (usually) it's the advancements that don't. In this season I will point to a pair of prospects that play for the Crew's Double-A affiliate, the Huntsville Stars. The first member of that squad I will point to is Lorenzo Cain, a player who, had he not been injured last season, might have vied for a starting spot on the Major League roster this season. In 2010 Cain is hitting .325 with a .408 OBP in 58 games. He's stolen bases (19 in 21 tries), gone for extra-bases (He has 100 total bases) and scored runs (43 in 58 games). So what possible reason could the organization have for slowing his development when an outfield spot in Triple-A is populated by 30-year-old Adam Stern, a player who on a good day is a step behind Brady Clark? Certainly there isn't one that makes sense. Another player who could stand a promotion is starting pitcher Amaury Rivas. Last year's Minor League Pitcher of the year, Rivas has had a very good 2010. He's posted an overall ERA of 2.96 and struck out 65 batters against 29 walks. Not dominant numbers but good enough numbers that he should receive a chance at Triple-A. Rivas is on the 40-man roster and thus is using an option year to pitch in the minors. The thought should be get him near the Majors as quickly as possible, especially if he is pitching well enough to earn that promotion. Another player that is performing superbly is top prospect Brett Lawrie, while I am for promoting Cain and Rivas, I am against promoting Lawrie - at least this early in the season. Because Lawrie skipped Advanced-A ball a full season with Huntsville is not a bad idea, even if he does lead the Southern League in total bases. The examples of Rivas and Cain are just a pair, the station to station promotion of prospects has been something that has chaffed fans for the entire Doug Melvin era. When pitchers or hitters are effective and dominant, keeping them at a level where their opposition is clearly over-matched does no good for anyone. Why did Milwaukee release Mike Jones exactly? It's easy to point to his high walk-rate and say he just wasn't cutting it in Triple-A, but if a roster spot was needed why was Jones the one to go when the organization decided to keep 35-year-old Marty McLeary who has already given up more runs in 8.1 innings (11 earned) than Jones did in 12.2 innings (one earned). This move hints at a problem I have with the Brewers overall approach to Triple-A this year, but even so makes absolutely no sense. 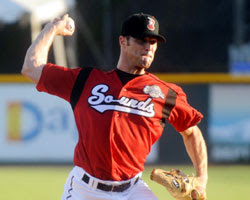 The team waited out injury after injury to Jones before he finally pitched his way to Triple-A and was promptly released because he walked 13 batters in 12.2 innings. Not a fair sample size. What adds to the absurdity of this move is that McLeary (again, 35 years old!) has allowed 90 hits in 45.2 innings this season. 90! The guy makes Jeff Suppan look like Cy Young! Why give Mike Jones so many chances and when he finally looks like he's started to turn a corner as a pitcher you release him? It's ridiculous, someone should tell the front office that Crash Davis was a fictional character. You know what I like to see at a minor league baseball game? Top prospects. That's why I have absolutely no interest in seeing the Nashville Sounds play. The only legitimate prospect that the Brewers have placed with their Triple-A affiliate is Mat Gamel. One player on a team of 25. Oh a case can be made for Brendan Katin or (if you're really pushing it) Tim Dillard, but the only player on that team seems to have a strong chance at the Majors is Gamel. This is a trend that Milwaukee has year in and year out but they are not the only ones. It's a common practice to load up the highest level of the minors with veterans who have major league experience or at least a ton of minor league experience. This year the Brewers have taken that practice to another level though. The outfield features Trent Oeltjen, Adam Stern and Brendan Katin. Stern hasn't had a hit in the majors since 2008 and Oeltjen has only 70 big league at-bats under his belt. Katin hasn't even had a chance to play in the big leagues, despite huge power potential (and even bigger strikeout potential). The infield isn't much more awe-inspiring, featuring never-been's such as Joe Koshansky at First Base, Luis Cruz at Shortstop and Rey Olmedo at Second Base. It's not that having a few of these guys on your Triple-A team is a bad idea, they can step into a major league role in a pinch, but an entire roster composed of scrubs like this does little for the future of a franchise. It's been said that pitchers and hitters learn the most in Double-A and Triple-A, so what are prospects learning when they aren't even playing at the minor's highest level? 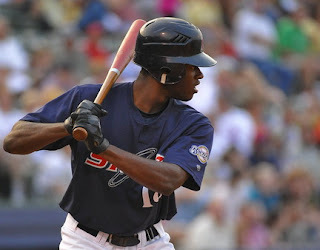 There is no argument that can be made that says the franchise is better off by letting Lorenzo Cain dominate Double-A rather than face a higher level of competition in Triple-A. When you see a pitcher like Rick Porcello or Mike Leake shoot up the ladder and contribute to their drafting club quickly you can't help but wonder if the Brewers will ever have a pitcher do that. Under the organization's current philosophy that will not happen. That is not a fair approach, performance should be rewarded more than it is. Yes, this is not true across the board. Ryan Braun and Yovanni Gallardo climbed the ladder quickly, as did Jonathan Lucroy and Rickie Weeks. But three of those players are position players and the Brewers difficulty in developing pitchers is well documented. Why should pitchers spend more time in the minors than position players, if they produce they should be given the same chances. Milwaukee has done a very good job developing their prospects into players. The bottom line, however, is that they could do better.